This summer has been one giant disappointment so far. With the exception of Star Trek, nothing has come out that can be deemed a "must see." That's where The Brothers Bloom comes in. With plenty of heart, emotion and laughs, it doesn't just adequately pass the time. It instead offers up a lighthearted, but surprisingly challenging film that deserves to be seen. The Brothers Bloom is pure entertainment. At the start of the film, we are introduced to Stephen (Mark Ruffalo) and Bloom (Adrien Brody), two young boys who one day decide to become conmen, with their first target being a group of fellow children, who they swindle for 30 dollars. Flash forward 20 years and the two brothers are rich from the many elaborate cons they have pulled off, somehow gaining millions through carefully layed out plans. But Bloom is sick of the game and decides to pull out, moving far away. After tracking him down, Stephen talks him into pulling off one last con in an attempt to fool Penelope (Rachel Weisz), an eccentric, oddball heiress into giving them her money. But as the con unfolds, Bloom begins to fall in love with Penelope and further complicates the matter. The Brothers Bloom are what you would call gentleman thieves. Their motto is that the perfect con gives both parties what they want. Sure, they're robbing their victims of money, but in return, they're providing them with something more, a sort of lucid exchange for their services. The conundrum here, though, is that the two brothers don't see eye to eye. Bloom doesn't decide to quit simply because he's tired. He quits because he's sick of manipulating innocent people through trickery and he knows in his heart that what he is doing is wrong. Stephen, on the other hand, has no reservations and never questions his intentions, not for one second wondering whether his actions are morally bankrupt. This is where the film succeeds where so many others have failed. While a movie like Ocean's Eleven can still entertain, internal conflict rarely occurs due to the abundance of characters with their eyes all set on the same goal. 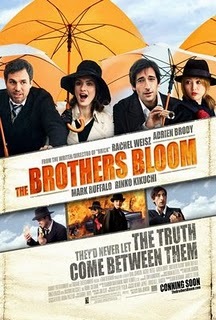 In The Brothers Bloom, the two primary characters are at odds with one another. It allows for more depth and character development, traits lacking in many con films. But that doesn't mean the film is all serious. On the contrary, the biggest asset to the movie is its humor. Because of the nature of the characters--Bloom emotionally drained and serious and Stephen playful and nonchalant--you'd think that the two comedic styles would conflict. Bloom is more deadpan while Stephen is more witty and fun, but rather than create a contradiction in style, the two styles converge to the same point, combining to form a unique and incredibly funny experience. While the actors deserve credit for sure, it's the writing here that shines through. Throughout the film, I was provided with smart storytelling, well written dialogue and ample amounts of intrigue. At one point in the movie, it felt like everything was wrapping up and the way it all seemed to be resolved would have been sufficient. I would have been perfectly content to see the movie end this way because my experience with it to this point was stellar, but it goes the extra mile and prolongs the ending to dive deeper into the story. When most movies do this, they tend to flail about wildly, creating unnecessary plot twists that further muck up the narrative, but The Brothers Bloom stays riveting, diving deeper into these interesting characters and bringing the story around full circle. It worked marvelously and now, upon reflection, I can't see it ending any other way. There were a couple of missed opportunities, however, including the first kiss between Penelope and Bloom. Penelope's character is offbeat, easy to like, but also easy to laugh at, and this moment was played for laughs, which took away some of the romantic fervor that the scene would have had otherwise. The romance between these characters is one of the largest foundations of the story, narratively and emotionally, so I would have loved to have seen a more serious approach taken to this pivotal moment in the story. Sometimes, it just tried too hard to be funny. Still, these minor moments don't detract much from the overall experience. Near the end, the movie starts to con you, the viewer. You're along for the ride the whole time, but at this point, you begin to question Stephen's motive. Is he conning his own brother, another elaborate scheme to get what he wants? Or has the situation truly gotten out of hand? It's this sudden character/audience relationship flip that drives this movie until the end. The Brothers Bloom is a hidden gem that I fear may fly under the radar in the wake of other more high profile films releasing this summer. Let's hope not because this is one of the best films to be released so far this year. It's a tad early to assume it will land a spot on my end of the year list, but don't be surprised if you hear me praising it when that time rolls around. The Brothers Bloom is a remarkable achievement and one of the most delightful films to be released in recent memory.